The Ultimate Technology Team Building Experience Austin is a tech city, and as such should feature the best tech based team building experience in the nation. Explore Austin Texas is delighted to bring the city and its guests the Ultimate Technology Team Building Experience! Featuring: Proprietary software enables groups to work together, and against other teams, in a technologically enabled GPS scavenger hunt. -	Augmented reality challenges (think Pokémon GO). Teams work together to solve puzzles and riddles. 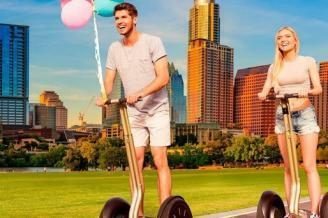 -	The Segway Experience. A brief orientation of the machine. A quick hands on training. Safe and exciting relay racing for the team! -	Electric Bike Missions. Along the scavenger hunt routes, teams are challenged to complete a task using a Fat Tire Electric Bike.